Last night, my friends and I had a meatloaf night. It's the time-honored tradition of asking everyone to bring a dish for an evening of food and fun, except we narrow "dish" to mean "meatloaf or things that go exceptionally well with it." I decided to make a sun-dried tomato and feta turkey meatloaf courtesy of Giada De Laurentiis. I've never made a meatloaf and it looked kinda funny when I was done, but everyone agreed, it was delicious! 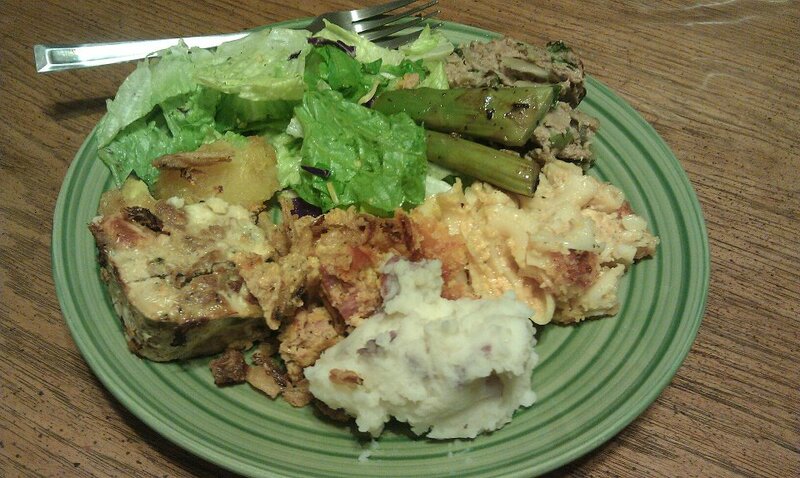 I forgot to take any pictures of it, but I do have a picture of my full plate! Mine is the cubish item on the left side. Seriously, it was so delicious! And I've decided meatloaf is the easiest meal ever! I will definitely be experimenting with different types.